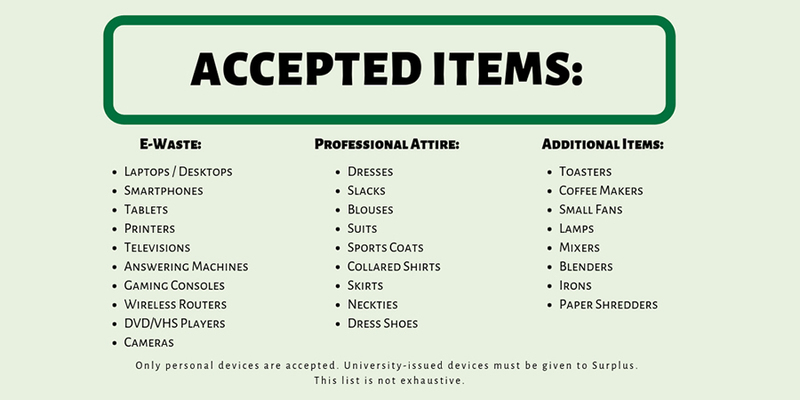 UNC Charlotte’s Office of Sustainability will hold a collection event for unwanted personal electronic devices (e-waste) and professional attire from 9 a.m. to 3 p.m., Wednesday, April 17, in Parking Lot 5A. Items collected will be donated to benefit those in need. Are you holding onto those outdated electronic devices that are too old to turn on? Do you keep upgrading to the latest iPhone and now have a collection of older ones? Are you still holding onto that VCR player, hoping that VHS tapes will make a comeback? Instead of letting these devices take up space and collect dust, why not recycle them? Research shows that 50 percent of working-class families don’t own a computer, while 70 percent of e-waste will end up in landfills. Donating devices at a collection event can make a difference for local families and the environment. The e-waste collection will accept any electronic device that can be plugged in or is powered by batteries. This includes computing devices and small household appliances. Items weighing more than 100 pounds will not be accepted. See the recommend list of items. Donated computer devices will directly impact the local community. Eligible devices will be given to Informative Technologies, located in PORTAL; this company restores devices, deletes personal data and then resells the devices to economically disadvantaged individuals and families at a minimal cost. Many students lack the professional or business attire to attend job interviews, internships, networking and other events. In an attempt to bridge that gap, the Jamil Niner Student Pantry, in coordination with the Office of Sustainability, is hosting a professional attire collection. The pantry seeks both men’s and women’s professional clothing of all sizes. They also request the items be freshly laundered. See the recommended list of items. After donation, items will be sorted and made available to the campus community through the Jamil Niner Student Pantry. “We are glad to help our campus community learn that their trash can help these worthy organizations," said Mike Lizotte, University sustainability officer. This event provides a unique opportunity for the campus community to donate e-waste and unwanted clothing because the University does not usually accept these items, except for state-owned property, which can be returned to Surplus. Lizotte encourages people to learn more about the mission and activities of Informative Technologies and the Jamil Niner Student Pantry.